The Whyalla team celebrate their Feedlot of the Year win, for yards over 10,000 head – from left, John Collman, Craig Thorne, Anthony Cash, with Simon Lakin from Elanco, as well as Gino Destefani, Leigh Streeter and Daron Higgins. Image: Peter Sechi Photography. 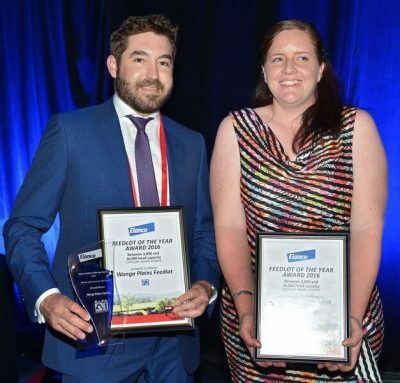 ATTENTION to detail and those small ‘one percenters’ that add up to outstanding performance were recognised among three commercial feedyards announced as the 2016 Elanco Lotfeeders of the Year at the Australian Lot Feeders’ Association’s BeefEx conference last night. 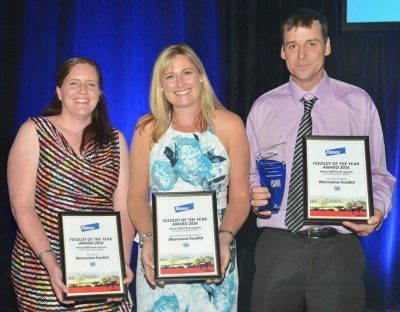 NH Foods Whyalla feedlot near Texas, on the Queensland/NSW border was named Elanco Feedlot of the Year for yards above 10,000 head category for 2016. “Our staff is our strength and special mention should be made of our long term staff who provide the training and encouragement to our more recent members,” manager Gino Destefani said. “Special thanks must go to our related subsidiaries and our parent company NH Foods. We would also like to thank our panel of consultants and advisors,” he said. “Just as important are our customers and suppliers who continue to work with us to improve – even during trying times. We believe that all the finalists are exceptional operations and it would be naive to assume we are superior in any way. On any given day we all have strengths and weaknesses. Today must have been our day. We love our feedlot, we love our industry and we have great pride in the beef we produce,” he said. With a capacity of 55,000 head, Whyalla and its 90 employees turn off more than 140,000 cattle a year for processing at the company’s Oakey and Wingham beef plants. The majority of the beef is destined for Japan where it is sold under brands including Oakey Angus Reserve, 1788, 1788 Platinum and Wingham Gold. JBS Beef City located west of Toowoomba which finishes 270,000 head a year as part of a vertically integrated business with the Beef City processing plant. Grassdale feedlot located near Dalby in southern Queensland. In 2015-16, 136,767 head were shipped out of Grassdale, including some sold under the company’s Phoenix Range brand. 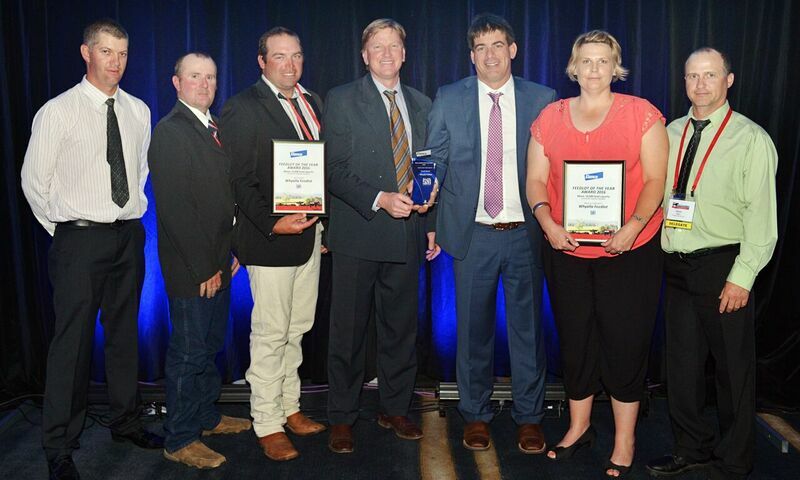 The 2016 Feedlot of the Year award winner in the 3000-10,000 head category was Camm Agricultural Group’s Wonga Plains feedlot, an integrated beef enterprise across nine Queensland properties. The Camm family have been feeding cattle at Wonga Plains since 1975 and run a number of specialist programs, including Wagyu. Bryce Camm collects the Feedlot of the Year award for yards 3000-10,000 head on behalf of Wonga Plains, with Cait Jenyns, Elanco. Image: Peter Sechi Photography. Bryce Camm, when accepting the award, paid tribute to his parents, David and Judy, who started out bag feeding small pens of cattle in the early 1970s. “It was their vision, coupled with the support we have from our team of employees and advisors which helped get us to where we are today,” Mr Camm said. Gundamain feedlot, a 6000 head capacity feedlot operated by the Herbert family in Central Western NSW. The business embodies the spirit of inter-generational family farming and has two feeding programs for 70 and 100 days. Gunnee feedlot, a 10,000 head facility near Inverell in Northern NSW owned and operated as part of a joint venture between Mort and Co Ltd and Sundown Pastoral Co. The partnership enables the business to extract synergies between the two companies and their experience in the supply chain. Weeroona Feedlot at Guluguba on Queensland’s western downs was announced at the feedlot of the year for yards less than 3000 head capacity. Cait Jenyns, Elanco (left) presents the Feedlot of the Year Award for the under 3000 head category to Tammy and Tim Stiller, Weeroona feedlot. Tim and Tammy Stiller run the feedlot as part of an integrated family breeding, backgrounding and feedlot business on 20,000 hectares. Weeroona consistently achieves 98pc compliance to the market specifications of long term customer Woolworths, with whom they have had a fortnightly supply contract since 1992. The runner up in the less than 3000 head category was Freestone feedlot – a custom feeding service located near Warwick, Queensland. The yard specialises in veal meat production and has an adjacent backgrounding facility. The Feedlot of the Year Awards are delivered by ALFA in conjunction with AusMeat, with support from Elanco, and are designed to celebrate a commitment to quality management systems and best practice across beef cattle feedlots of all sizes. A thorough judging process is used based on the National Feedlot Accreditation Scheme. This includes QA culture, product integrity, environmental responsibility, animal welfare responsibility and business planning. 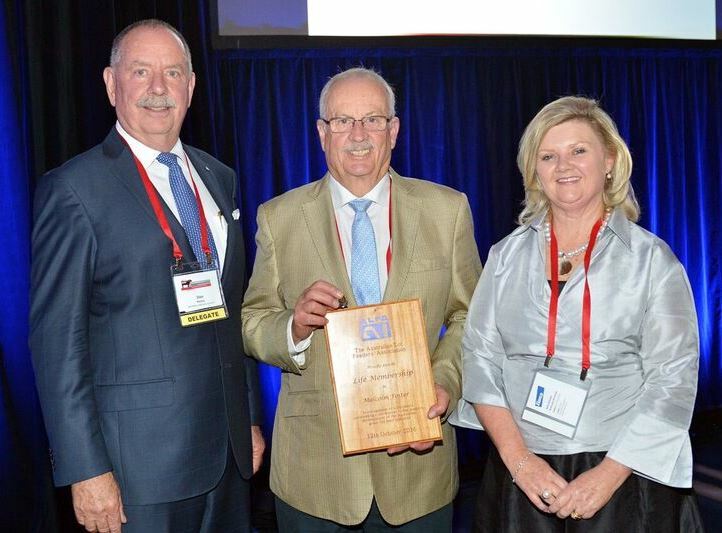 As part of last night’s industry celebrations, ALFA presented an honorary Life Membership to former general manager of the Rangers Valley feedlot, Malcolm Foster, who was also a long-time ALFA councillor who served as president over two cycles. The award was presented by Don Mackay, chair of the Red Meat Advisory Council and also a past President of ALFA. Mr Mackay spoke of Mr Foster’s numerous achievements, saying he had contributed significantly to the lotfeeding sector. In his acceptance, Mr Foster said he had got as much, if not more, out of ALFA than he had put in.